On 15 April, Clare was honoured to be able to show Particulart at TEDxExeter. For those who haven’t come across the TED talks phenomenon yet, do check out TED.com. TED is dedicated to ideas worth spreading. It started as an annual conference, but is now much more. TEDx is a programme of local, self-organized, independent events that bring people together to share a TED-like experience. TEDxExeter has been held each year since 2012. In 2016 the theme was “Dreams to Reality”, and it featured a wide range of wonderful speakers. Danny Dorling showed us how different ways of mapping the world can communicate many different hopeful realities. Alan Smith, data visualisation editor at the Financial Times, gave a really engaging talk about statistics are about Us – the community not the individual – and how they can highlight gaps in our understanding of the world, our country, and even our local area. TEDx events also show a few TED talks as part of the programme. Among others, we got Al Gore on “The case for optimism on climate change”. A nice lot of Particulart-relevant material! 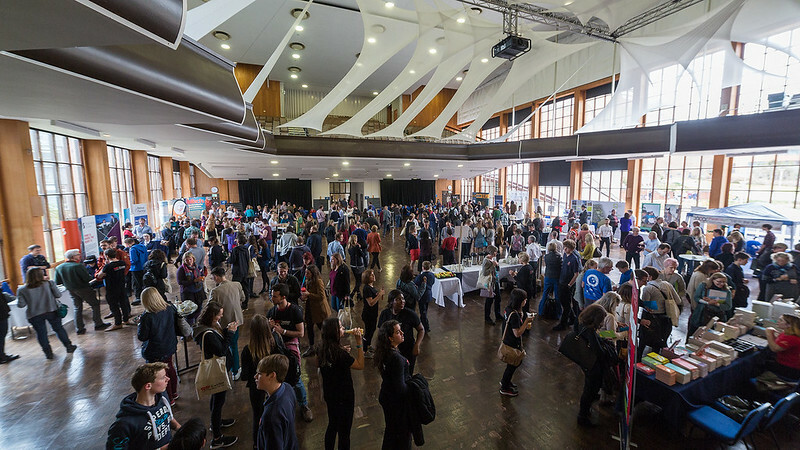 The main focus of the day is on the speakers and performers, but there are generous breaks for coffee, lunch and tea, to enable speakers, performers, delegates, sponsors, stall holders, team, and volunteers to mingle and connect. Particulart was one of many stalls in the break-out areas. Others included sponsor stalls, the FabLab hosted in Exeter Library, the Met Office Informatics Lab, and an exhibition of prints from Al Mutanabbi Street Starts Here. Clare had some great conversations during the day, especially with many of the school children and young people. She also took the opportunity to talk about her new artwork about flood risk, which was of particular interest to a group from Route 39 Academy in Clovelly, with memories of flooding on the north coast of Devon in recent years. There’s lots more information about the issues and the actions you can take on the Particulart website.